A modern day washing machine comes with a plethora of complex features and smart technology. These features are so confusing at times that it’s difficult to decide what to choose and what not. In the market you have machines ranging from 5k to 1.5k. An advanced machine comes with innovative and unique features to suit a particular lifestyle and budget. If you have been a washing machine user a few years ago, you would have often sighed, ‘I wish this machine could……’ Voila!.., with technology transformation all that you wished for then, is built into the machine of today. Is it worth paying extra for spinning capacity? Spinning capacity of washing machines affects the quantity of water removed from the wet clothes after the rinse cycle i.e it determines how dry your clothes will be once the rinse cycle completes. Spinning capacity varies from 600 to 1800 rpm, with washers at higher RPM’s significantly more expensive than lower RPM ones. While the spin speed requirement for different types of clothes is different, we have found in our research that spin speed of about 1200 rpm is sufficient in most cases. Beyond that a higher RPM may not deliver “value for money”. Variable spin speed: If you want to directly take off that extra moisture from clothes, this feature allows you to do so. Washing machines have in-built programming with correct spin speeds built into the cycle that you can select. Autosoak: It is a common feature in most washing machines today. Once the cycle starts, the machine draws water just enough to soak the clothes and adds detergent. In some programs it will use warm water to soak. The machine rests for 15 to 20 minutes depending on the program, then washing cycle starts. Sensor Technology: Machines have various sensors inbuilt. Amazing iSensor technology automatically adjusts the wash cycle according to the amount of detergent, water temperature and water hardness. Water level selection: The amount of water drawn is as per the program selected. In some machines there is an option of manually selecting the water level. Some machine have upto 10 level selection. Wash Programs: Do you have variety of fabrics in your laundry? No worries. Different fabric needs different wash cycle. The Smart Program function has Easy Care, Quick Wash, Wool, Delicates and many more, which will help you clean all fabrics at just the push of a button. Programs are all fabric-specific. Each program has a preset water, temperature and RPM setting so that the clothes come clean without any damage to the fabric. Eg: cotton,Wool, synthetic, etc. Prewash: An extra small wash prior to the regular cycle wash. Ideal for excessively soiled clothes. Quick /Express Quick wash feature: If you are in a hurry or have fewer loads or less-soiled clothes to clean. This option can be used on all types of fabrics. It reduces the wash time by 30% to 50%. 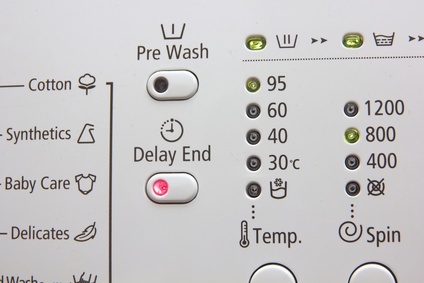 Hot Water Wash: Hot water washes clean clothes better, so some high end washing machines include the hot water wash feature. This feature is particularly useful when washing difficult stains, nappies and murky clothes. Allergy: This program is especially designed for garments that require special care, such as baby clothing or clothing worn by people with sensitive allergic skins. By prolonging the maximum wash temperature, increasing the water level and adding an extra rinse. combined intensive wash and rinse cycles on this program ensures excellent results. Handwash: This program enables you to safely wash delicate hand-wash fabrics such as silk and cashmere. The wash action is very gentle to avoid shrinkage. Steam Programming: The heater present inside prepares steam out of water. Steam being lighter than water, penetrates deeper into the fabric and extracts out even the tiniest of dirt particle. It can be used on ‘dry clean only’ clothes. Additives: Allows you to add fabric softener, disinfectants, Starch for cottons and Blue liquid for whites. Auto Softener Dispenser: A specially designed compartment allows you to add softener before you start the wash. Fuzzy Logic: This feature is like a magic-wand. It uses a variety of sensors. A one-touch button performs the whole washing cycle. The Fuzzy system automatically assesses the best washing condition according to the load of laundry, adjusts water and temperature to ensure the optimum wash.
6 Motion Technology OR 7 Motion technology: The wash cycle incorporates 6/7 different types of motions- Scrubbing, Rolling, Stepping, Swing, Tumbling, wringing and Filtration. These replicate the motions of a handwash to give your clothes the most effective wash in the best gentle manner. Depending on the type of cloth & dirt level, clothes are washed changing the motions. Time Delay: This feature allows you to select the program and delay the time of start from 1 hr to 9 hr depending on the model. You can plan your wash time more flexibly. Auto Restart: In the event of a power failure, the machine records the cycle. When power resumes, the cycle continues from the point where it stopped. Tub Clean: fungus and toxic substances develop due to regular use of the washing machine. The Tub Clean function cleans every corner of the tub. Wash Load sensor: This sensor can modify and reprogram the wash cycle as per the load. In the case of an overload on any side it can even balance the washing machine preventing the machine from hopping/jumping. Auto Imbalance Sensing & Control: This system ensures that the load is equally distributed around the drum. thereby eliminating the vibration and noise created by imbalance. If the load is improperly distributed, the machine automatically adjusts the Spin Speed. It provides complete stability during spinning. Protective Rat Mesh: Rodents are a big threat to washing machines. An additional cover at the bottom of the machine protects against damage due to invasion of rodents. Child Lock: This feature is important so that by mistake little fingers don’t alter the program setting. There are a wide range of features available for the ease of comfort of the user to provide a hasslefree experience. Each machine is built targeting a particular section of the society.Select the best one to suit your needs. Please don’t forget to read our Washing Machine buyers guide for helpful tips before making a purchase. Next story Frying without ill effects! !